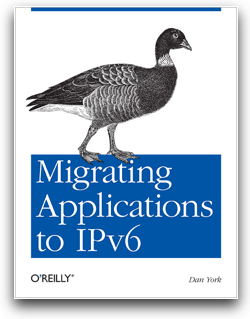 Added new section on recent events and changes that make it critical for application developers to be thinking about IPv6. Expanded text about “Happy Eyeballs” algorithm and included mention of RFC 6556 for testing for happy eyeballs. Added additional resources, including a new section about some informational RFCs that may be of interest to application developers. If you previously purchased the book directly from O’Reilly, you should have been notified of this update. I’m very appreciative of the feedback received thus far – and definitely welcome further feedback! I’ve also received many kind words and comments that the book has been very helpful. That’s great to hear… and exactly why I wrote it! This server has received 4034669 hits from both ipv4 and ipv6.